Khalid S, Zaheer S, Wahab S, Siddiqui MA, Redhu N, Yusuf F. Fibromatosis Colli: A Case Report. Oman Med J 2012 Nov; 27(6). Fibromatosis colli is a condition of benign proliferation of fibrous tissue within the sternocleidomastoid muscle leading to focal or diffuse enlargement. Clinically, it presents as neck mass with restriction of neck movement, usually in infancy. Though the exact etiology is not known, it is mostly attributed to ischemia of the muscle likely due to birth trauma.1 USG is a useful, easily available, non-invasive imaging modality helpful to diagnose the condition. A two week old neonate was referred to the radiology department for evaluation of a right sided neck swelling that had been noticed by the parents since one week. The mother also noticed restricted neck movement on the affected side. On clinical examination, the swelling was firm to hard in consistency and was not warm to touch. The patient was otherwise healthy. The parents informed that the child was delivered by cesarean section for breech presentation. 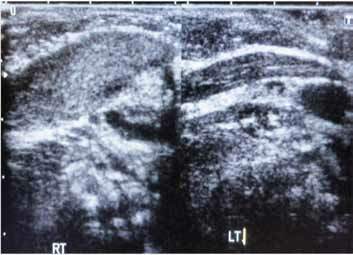 Ultrasonography (USG) showed a bulky right sternocleidomastoid muscle (Fig. 1), fusiform shaped and heterogeneous in echotexture when compared to contralateral muscle (Figs. 1 & 2). No significant change in internal vascularity was seen. The fibrillar structure of the muscle fibers was however maintained. There was no cervical lymphadenopathy. Based on these clinical and USG findings, a diagnosis of fibromatosis colli or sternocleidomastoid tumor of infancy was made. Physiotherapy given at home by the parents was the mainstay of treatment. Parents were advised to rotate the head of the child atleast 5-6 times daily, towards the side of the lesion and hold it for few seconds in this position. The parents were also explained that the procedure should not be forceful and should be stopped at the point of slight resistance. The swelling showed a slight decrease in size after 6 weeks follow-up (Fig. 3), with the neck movements returning to near normal. 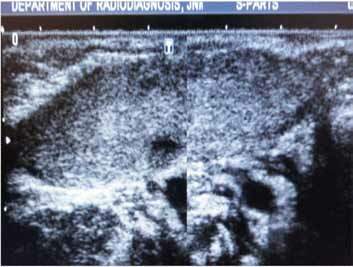 Figure 1: High frequency transverse USG scan shows bulky and hypoechoic right sternocleidomastoid muscle with normal visualization of left sternocleidomastoid muscle. Figure 2: High frequency longitudinal USG scan shows fusiform enlargement and heterogeneous echotexture of right sternocleidomastoid muscle with maintained fibrillar structure. 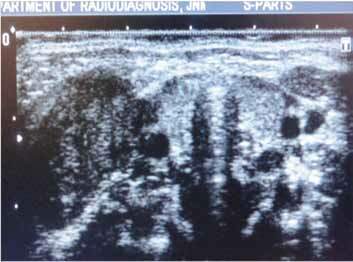 Figure 3: Follow up USG scan after 6 weeks shows slight resolution of altered echotexture of right sternocleidomastoid muscle. Fibromatosis colli is categorized as a benign fibroblastic proliferation, according to 2002 WHO classification of soft-tissue tumors.1 The disease is typically unilateral, bilateral involvement is rare. Its prevalence is estimated to be 0.4% of live births. Its etiology is not known, but may represent a scar like reaction to injury of the sternocleidomastoid muscle in the last trimester of intrauterine life or during delivery.1 It is frequently accompanied by a history of birth trauma, difficult delivery (especially forceps use) or breech delivery. The most likely cause in our patient seems to be intrauterine injury to sternocleidomastoid muscle as there is no history of birth trauma or difficult labour. The lesion almost exclusively affects the sternocleidomastoid muscle. Patients are typically normal at birth and present with restriction of neck movement and enlarging neck mass at around 14-28 days after birth. Sternocleidomastoid muscle appears shortened with fusiform thickening resulting in torticollis. This results in rotation and tilting of the head toward the side of the lesion. Facial and skull asymmetry (plagiocephaly) on the involved side are other problems that may be encountered in these patients. Gradual spontaneous resolution by the age of 2 years is seen in majority of cases. Fibromatosis colli is a relatively rare cause of neck mass which can be confidently diagnosed using high frequency USG, thereby decreasing the parent`s anxiety and unnecessary investigations. Physiotherapy with follow-up would suffice in majority of the cases. MRI is advocated in doubtful cases. 1. Fletcher CD, Unni KK, Mertens F. Pathology and genetics of tumors of soft tissue and bone. Geneva: World Health Organization, 2002. 2. Lin JN, Chou ML. Ultrasonographic study of the sternocleidomastoid muscle in the management of congenital muscular torticollis. J Pediatr Surg 1997;32:1648-1651. 3. Crawford SC, Harnsberger HR, Johnson L, Aoki JR, Giley J. Fibromatosis colli of infancy: CT and sonographic findings. AJR Am J Roentgenol 1988;151:1183-1184. 4. Ablin DS, Jain K, Howell L, West DC. Ultrasound and MR imaging of fibromatosis colli (sternomastoid tumor of infancy). Pediatr Radiol 1998;28:230-233. 5. Sharma S, Mishra K, Khanna G. Fibromatosis colli in infants. A cytologic study of eight cases. Acta Cytol 2003 May-Jun;47(3):359-362. 6. Joyce MB, de Chalain TM. Treatment of recalcitrant idiopathic muscular torticollis in infants with botulinum toxin type A. J Craniofac Surg 2005;16:321-327.